Commuters on Monday waded through traffic snarls, hopped on buses or ferries, or opted simply to stay home as two of San Francisco Bay Area Rapid Transit's largest unions went on strike, halting train service for the first time in 16 years. No BART trains ran on Monday, and the walkout derailed the more than 400,000 riders who use the nation's fifth-largest rail system and affected every mode of transportation, though the congestion, most agree, could have been worse. Transportation officials said another 60,000 vehicles likely headed out on the road, clogging highways and bridges throughout the Bay Area. Early Monday, that was true in parts of the Bay Area, especially Insterstate Highway 580 westbound. BART stations effectively looked like ghost towns by the middle of the morning. Before the sun came up, though, there was plenty of activity. Union members marched around the BART station near Oakland's Lake Merritt, and one picketer, Ron Smith, called the unusual strike very "unsettling." The news could have been worse, though, AC Transit workers, who also planned to possibly strike on Monday, did not. Lines snaked around corners at 20th and Broadway in Oakland about 8 a.m. as commuters were trying to board AC Transit buses to get to work. On the first day of the strike, at least one commuter appeared to be nonplussed about his longer travel time. "You just have to go with the flow," said Oakland commuter Matthew Robinson, who was at least 30 minutes late for work when he spoke with NBC Bay Area. Commuters in Fremont hopped on charter buses that came to the BART station in that city, about 10 miles north of San Jose. The buses took riders to Oakland, where passengers had to board yet another bus if they wanted to get to any other destination. One woman fell as she was trying to get on a bus. During the evening commute, freeways, buses and ferries were overloaded throughout the region. However, an NBC Bay Area live cam found traffic to run smooth once commuters crossed the Bay Bridge from San Francisco toward Walnut Creek. One commuter, Prachi Bora, said she didn't mind that BART workers were striking for better pay; she only wished she knew about the transportation stoppage earlier. BART spokesman Jim Allison told NBC Bay Area that BART was operating at "1 percent capacity," and he vowed that management and the union would go back to try to "work things out." At the end of the morning commute, BART spokesman Rick Rice apologized, but blamed the union for the problems. "We are sorry peoples' lives have been disrupted by the union strike," he said in a statement. "The strike is not necessary." The strike was called Sunday after an 11th-hour effort to resume negotiation failed to produce a new contract by the deadline of midnight. Both the unions and management said they were far apart on key sticking points including salary, pensions, health care and safety. In the Monday BART statement, Rice said that management is "prepared to negotiate the significantly improved proposal we delivered on Sunday." "A strike is always the last resort and we have done everything in our power to avoid it," said Josie Mooney, a negotiator for Service Employees International Union Local 1021. "I'm deeply disappointed it has come to this," said Antonette Bryant, president of Amalgamated Transit Union Local 1555, at a midnight news conference. Bryant said the union's members "aren't interested in disrupting the Bay Area, but management has put us in a position where we have no choice." These competing sides came to a head Sunday night with BART accusing negotiators of walking away from the bargaining table, while the SEIU countered in a statement that management "threw in the towel." Bay Area residents fell on both sides of the coin regarding the strike. 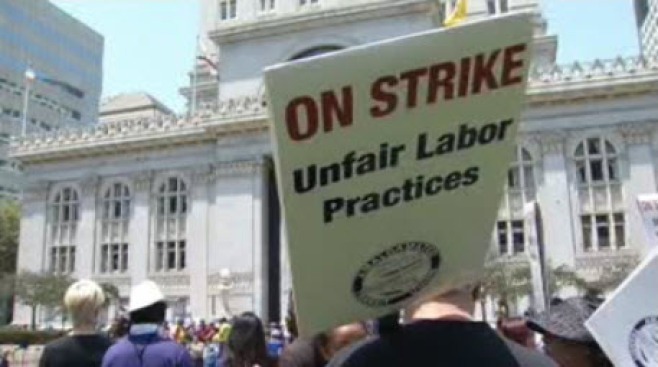 Michael Giannini posted on NBC Bay Area's Facebook page that he hoped "they bust this strike. I'm all for livabile wages but these people deserve no sympathy." Conversely, Linda Pallotta posted that she thought BART workers definitely deserve to earn more money. The average salaray for a train operator is about $60,000. The unions, which represent nearly 2,400 train operators, station agents, mechanics, maintenance workers and professional staff, were asking for a 5 percent raise each year over the next three years. BART said that train operators and station agents in the unions average about $71,000 in base salary and $11,000 in overtime annually. The workers also pay a flat $92 monthly fee for health insurance. Rice said the agency had up its original offer of a 4 percent pay rise over the next four years to 8 percent. The proposed salary increase is on top of a 1 percent raise employees were scheduled to receive Monday, Rice added. The transit agency also said it offered to reduce the contribution employees would have to make to their pensions, and lower the costs of health care premiums they would have to pay. Bryant said Sunday that BART's latest proposal is not an actual pay increase, calling it "surface bargaining." BART's last strike lasted six days in 1997. The transit agency handles more than 40 percent of commuters coming from the East Bay to San Francisco with the Bay Bridge handling another 50 percent said John Goodwin, a spokesman for the Metropolitan Transportation Commission. NBC Bay Area's Damian Trujillo, Mike Inouye and the Associated Press contributed to this report.